DALLAS, May 10, 2012/ — Attention savvy shoppers! From Friday, May 11th to Sunday, May 13th, MyHabit, Amazon’s membership-only fashion destination, will host a special Spring Score series featuring designer and boutique apparel, accessories and home décor at up to 60% off, and during some sale events, at an even deeper discount – up to 80% off. 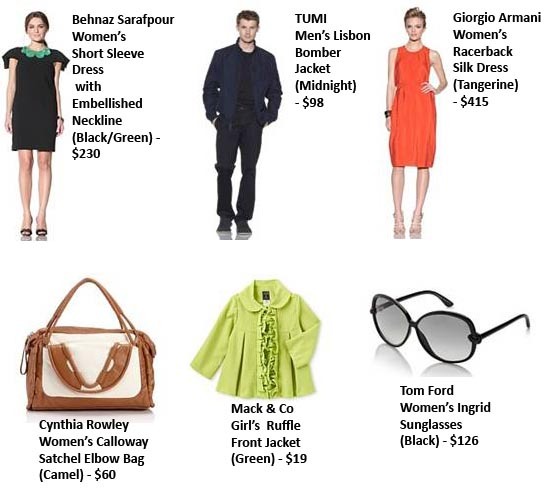 Members will be able to seriously save on spring essentials from coveted brands such as Cynthia Rowley, Giorgio Armani and Tom Ford for the gals, TUMI, Robert Geller and Nicholas K. for the guys, Laura Ashley, Osh Kosh and Lunchbox for kids and Roberto Cavalli Casa, Reed & Barton and Rachel Ray for the home. With major markdowns like these and fast, free shipping and free returns, the selection is sure to go fast so please share these sale events with your readers so they can shop early.